In life, some say all good things start at home. Same is true for your website. Getting your own house in order is the best place to start for SEO. We’ll help you through the nitty gritties of getting your website in shape. SEO is the process of affecting a website or web page’s natural or unpaid, organic search engine rankings. On-page optimization refers to working deeply into your own site to get it “as good as it gets.” If your site is not well optimized, the rest of your online marketing loses effectiveness. All of your efforts will fall short of optimum performance. Establishing keyword relevancy on a website is a main focus of on-page optimization. 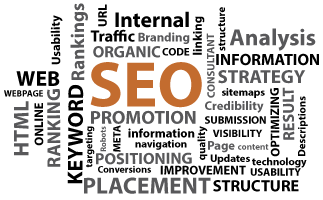 This allows optimized pages of a website to be crawled and indexed for specific keyword phrases or towards specific keyword categories. Another primary objective of on-page optimization is getting your optimized pages stored in the proper search engine decks. An integral part of SEO, this process ultimately impacts how well your website ranks in the search results. To thoroughly optimize your website, a comprehensive look at many elements is required beyond simple examination of keywords and phrases. When done right, on-page optimization is a very involved and extensive project. What comes with on-page optimization? As with our other services, on-page optimization projects are customized from the ground up. Depending on how in-depth you want to go, we can also tie in web development to update the code of your website or alter usability. These steps can create a better user experience which ultimately influences your search engine rankings in an upward direction. Once your website has been on-page optimized to create a solid foundation, some of our other SEO services can further enhance your site performance. For example, link building services can boost rankings and also drive more traffic to your website.